Here are some photos to remind you of the ‘year that was’. 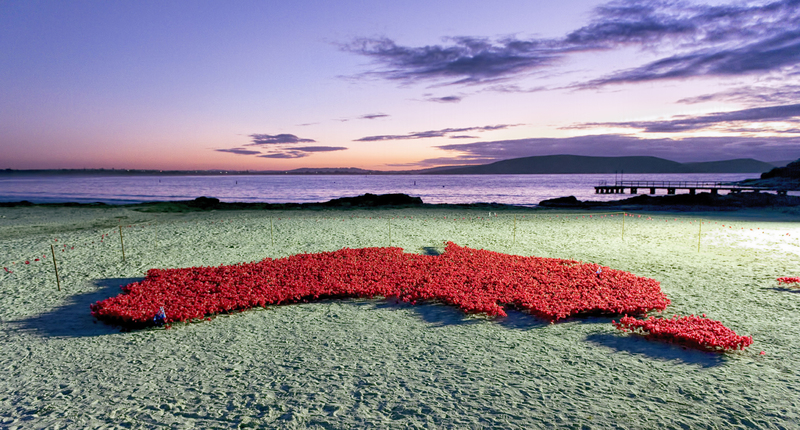 One hundred wooden crosses in memory of Albany’s WW1 casualties were planted in a sea of poppies. As always, it was MBG members Pat and Ron Kerruish and Nan and David Anderson who were the backbone of this wonderful community project. A special thanks to Ron for co-ordinating the making of the wooden crosses. It was a beautiful sunny winter morning to ‘open’ our entry statement at Eyre Park near the roundabout. Mayor Denis Wellington did the honours, with Elder Lester Coyne contributing a Noongar perspective to the area. Sue Codee’s sculpture depicting aspects of Middleton Beach was very well received by all ages, with the younger members of the audience also enjoying Jamie the Clown’s road safety messaging, sponsored by the Road Safety Commission. Our thanks to Sally Malone for managing the sculpture production and installation, and for the complementary plantings, and to MBG member Caroline Cameron for seeing the project through on MBG’s behalf. A big thank you to Southern Ports for their substantial donation towards the project. A large crowd of around 200 filled the Surf Club on November 1 for the launch of Murray’s book. Local historian Malcolm Traill gave the launching speech, and both he and Murray related some interesting and amusing stories about Middleton Beach in the early days. The Shantymen entertained the audience before and after the speeches, and images from the book scrolled through the TV monitors. Book sales were encouragingly brisk – proceeds after production costs will be shared equally by MBG and Hawthorn House. The book can be purchased from Bay Merchants, Paperbark and the WA Museum bookshop. November 11th saw our sixth and final installation. This time, it was ‘PEACE’, a simple, strong and hopeful message appreciated by the many community members and visitors who participated. A closing ceremony was held to mark our final contribution to the four year commemoration. Peter Potter read ‘In Flanders Fields’, as he had at our opening ceremony in November 2014 marking The Departure; Hamish McGregor and Caitlin Smith from the Albany Light Opera Company also gave a reading, Eugene Eades s sang his own composition in memory of his father who served in WW2, and Kevin McCreton and his impromptu band played for us. Well deserved presentations were made to the Kerruish & Anderson team who devised, co-ordinated and presented ‘Poppies in the Sand’ for six installations over 4 years – a superb effort. 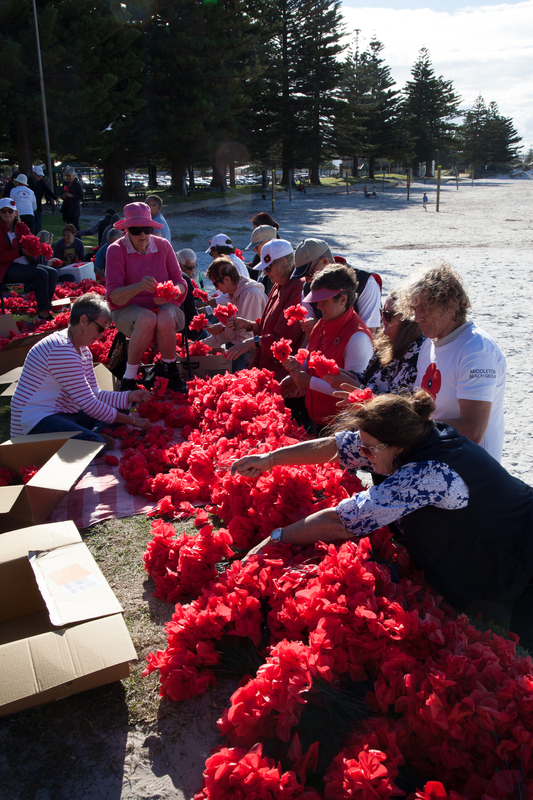 The fourth MBG ‘Poppies in the Sand’ Anzac commemoration was another great success, thanks to all those community members who helped ‘plant’ and dismantle the 28,000 poppies comprising this year’s design of a 15 metre wide wreath. Thanks also to the roster volunteers who had to endure some ordinary weather, and a special mention of staff and students from the Australian Industry Trade College, Qld, who put in many hours over the four days and were clearly moved by their Albany Anzac experience, which they described as life changing. 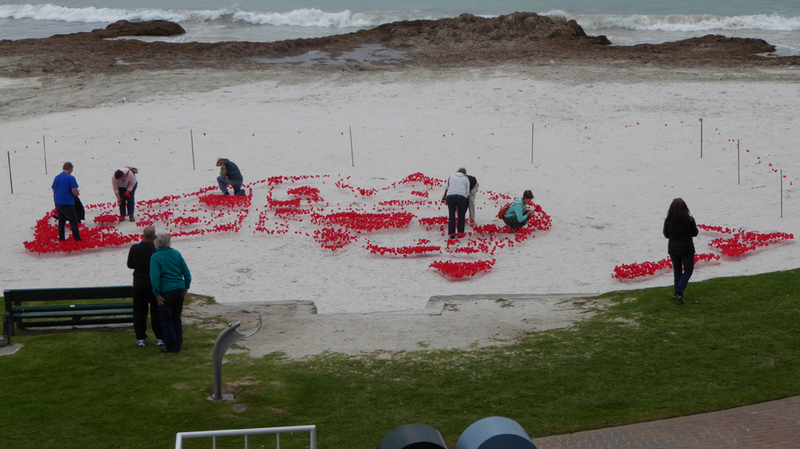 They were inspired by our poppy project and how it brought community together in so many dimensions. We hope to maintain the connection with the College for 2018. The Middleton Beach Group was well represented at the City of Albany’s recent Keep Albany Beautiful awards. Chair Jane Mouritz was awarded a Certificate of Appreciation for her tireless war on neighbourhood litter and committee member Robyn Greeuw received the Best Business Garden award on behalf of the Middleton Beach Holiday Park. It was a family affair with sisters and MBG supporters Rhonda Appleton, Deb Docking and Jennifer Wignall also acknowledged for their efforts in keeping Middleton Beach litter free. We are now calling on volunteers to adopt a street or open area for the coming year, as your ‘patch’ to keep litter free. The response so far has been quite positive but we need more hands! If you can help, please contact MBG secretary Barb Madden on barbara2@iinet.net.au. The Middleton Beach Group’s entry statement survey was provided to the City of Albany and discussed with representatives at a meeting on 27th March. The City of Albany was appreciative of the work undertaken by the Group, and advised the City intended to provide entry statements to a number of areas in the City, subject to budget considerations in July. Subject to Council approval, the Middleton Beach entry statement could be one of the first to be progressed. Once Council approval was provided professional design expertise will be sought and options for a sculptural feature developed, using community input provided by the entry statement survey. 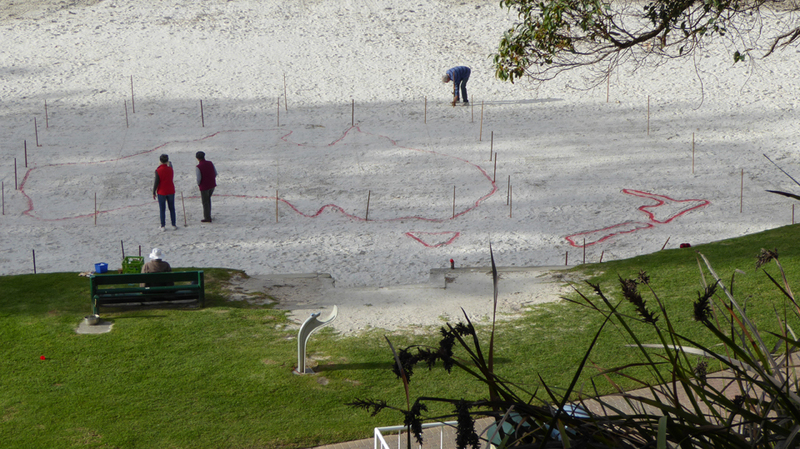 The Middleton Beach Group has offered some financial assistance to help design this feature. The entry statement survey also provided 41 suggestions for projects that could be undertaken by the Middleton Beach Group to improve the area. Most of these are on reserves managed by the City of Albany, and so Jane Mouritz and Susanne Denning met with Mark Ford from the City to discuss the community suggestions in more detail. The City has advised some of the suggested projects, such as improved car parking in Eyre Park, will be undertaken by the City. Other projects, such as the planting of trees along Middleton Road, will require further consideration and planning, prior to budget considerations. Projects such as reducing drainage onto the beach are likely to be long term and involve other landowners and developers. A number of projects that could be undertaken by volunteers, such as the removal of typha and rubbish from the lake in Eyre Park, have already been started. People interested in any project ideas are encouraged to attend Middleton Beach Group meetings or join the email contact list. MBG presented two main events for the Anzac 2015 commemorations. 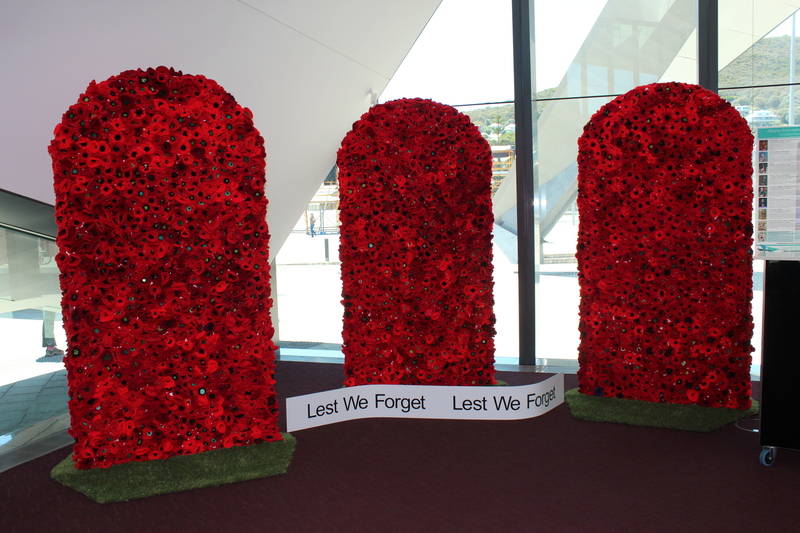 ‘Lest We Forget’ headstones once again looked imposing and impressive in the AEC foyer, and the Town Hall foyer. 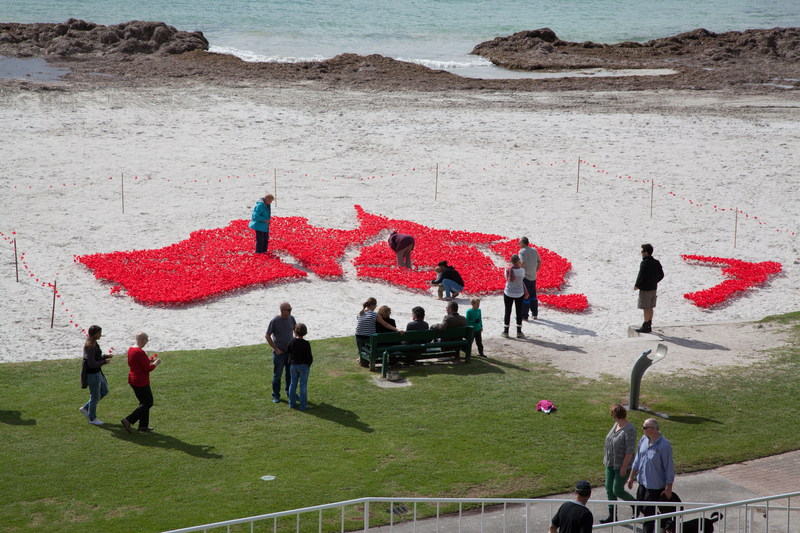 Both venues attracted high visitor numbers attending functions over the weekend..
‘Poppies in the Sand’ at Ellen Cove took the form of a map of Australia and New Zealand, filled with nearly all of our 30,000 plastic poppies, planted by the public. Amazing! We had learned from our November experience that the local community and visitors really wanted to be involved, so we took the risk of relying on them to come along and do the job, and it paid off. It was also a great community effort to get them all packed up and ready for next year. Ron Kerruish deserves congratulations for working out how to draw the map, with help from Patti. Additions were made by those who cared – Stewart Island, Rottnest, and King Island appeared! Thanks to Mayor Dennis Wellington who first suggested that we do the map. Meanwhile, our chairman Jane Mouritz travelled to Melbourne with a few poppies to add to the huge display of 250,000 at Federation Square. Our headstones were certainly not needed to swell the numbers, though Jane says they would have looked stunning had we not decided that Albany was a more appropriate location. So, it’s two down and four to go – three more Anzac Days then the culmination of the WW1 Commemorations on November 11, 2018.